The problem with the old thin client model was the assumption that processing power was scarce. In fact, Moore’s Law and the rise of ARM has made the exact opposite the case – processing is abundant. Data, on the other hand, is scarce – indeed, it is the scarcest resource in technology. To be precise, I’m referring to personal data – my data, if you will – the opposite of “big data.” Were I to no longer have access to my various documents, pictures, emails, etc., I couldn’t simply walk into the store and pick up some more, and you couldn’t loan me yours. It’s precious, and it’s worthless, all at the same time. From “The (Alleged) 13-inch iPad and the Triumph of This Devices”. Click for the original article. Dropbox’s approach to my most important data is much more in line with the value I ascribe to that data: it’s available everywhere. Not so for iCloud: data is available only on Apple devices, and it’s not exactly clear how to get it out…The only coherent strategy for Apple is a walled-garden of sorts that protects their vertical business model. 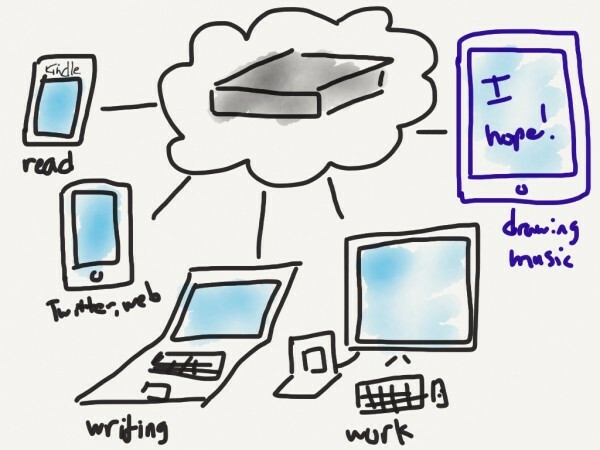 A services-centric company like Dropbox, on the other hand, ought to pursue a horizontal strategy predicated on maximizing the number of interconnects with the layers above and below. Today, though, I’m not so sure; Dropbox’s model makes sense theoretically, but it ignores the messy reality of actually making money. After all, notably absent from my piece on Business Models for 2014 was consumer software-as-a-service. I’m increasingly convinced that, outside of in-app game purchases, consumers are unwilling to spend money on intangible software. That is likely why Dropbox has spent much of the last year pivoting away from consumers to the enterprise. Consumers need to be convinced of the value of their data – Despite the fact that data is precious and unique to each consumer, the vast majority of consumers don’t know or don’t care. Backblaze, the online storage company, found that only 10 percent of people backup regularly; I would imagine anyone reading this who has tried to convince friends and family to buy a $70 drive for Time Machine or similar is nodding wearily. While backup is not the primary use case for Dropbox, the broader point remains: before Dropbox can get a consumer to pay for their data service, said consumer needs to value data in the first place. The situation is the exact opposite in the enterprise; data is what ties the entire operation together, and it’s difficult to imagine any company anywhere that is not intently concerned with its data even before you consider the various regulations around data safekeeping. It is much easier to sell something to someone who already knows they need what you have on offer. Consumers have multiple free options – As I noted above, Dropbox’s horizontal orientation aligns their incentives with my need to have my data available anywhere. Most consumers, though, are much less likely to consider such intricacies when deciding where to put their data. Instead, convenience usually wins, and it’s more convenient to use iCloud, SkyDrive, or Google Drive on Apple devices, Microsoft devices, and Google devices respectively. Enterprises, on the other hand, will never choose one of the free services offered by platform providers: the licensing terms are usually unacceptable, there is no guarantee of uptime, security is a significant concern, there is no top-down control, and there is no customization. Thus, while there may be competition on price within the enterprise space, that price will not be zero. It should be obvious that this makes monetization easier. Consumers are hard to market to – Reaching the sort of scale to profit from consumers requires converting millions; if you consider how few consumers even know their data is important, and the fewer still that are willing to pay, that means the top of your consumer marketing funnel must be exponentially larger. This then requires a huge amount of money for advertising as well as an advertising message that is sufficiently broad and non-specific to appeal to your addressable market. This is another stark difference with the enterprise, where most marketing is still done to a small group of individuals in the senior leadership of the company, particularly the CIO. Influencing just one person can result in many thousands of users; more importantly, the ability to actually sit down and have a conversation lets you more effectively tailor your message and sell your product. For consumers, collaboration is an edge case – Most of the data that matters to consumers is for use by them alone; that’s part of what makes the data so valuable on an individual basis, but it also means collaboration and general sharing of files is only necessary every now and then. This reduces the perceived utility of Dropbox, making it even more difficult to monetize (particularly with the freemium option sufficing for any collaboration needs that do come up). In contrast, what is an enterprise if not a collection of people and the data they jointly create and consume? Data belongs to the corporation, and by definition requires collaboration. Collaboration features, then, are a necessity, and the quality and ease-of-use of them is of primary importance. Any service that excels in this area is meeting a real need (and, as I just noted, the direct contact entailed with enterprise sales lets you explain these features clearly). Again, platforms are hard, but the incentives and obstacles in the enterprise are reduced; thus, the likelihood of seizing the potential upside is increased. By 2007, Box’s user base had doubled 20 times over and annual revenue was around $1 million. But Levie felt uneasy. The price of hard disks was falling 50 percent every 12 to 18 months. As online storage became a commodity, what would stop Apple, Google, or Microsoft from giving it to customers free? He noticed that the customers who stuck around longest weren’t storing MP3s or JPEGs but Word, Excel, and PDF files. In other words, business customers. Moreover, their colleagues would follow their lead, generating a steady stream of new sign-ups. Levie decided to ditch the fickle consumer market and focus on serving enterprises, companies with thousands of employees, which would be willing to pay for a storage service tailored to their needs. He set about adding the capabilities required by large businesses: search, security, and the ability to create and delete accounts, manage file access, and grant permission to view, edit, or delete. In other words, what we have here is one of the more interesting business experiments we’ve ever seen: is it better to have established a firm foundation in the top-down enterprise market that actually matters – i.e. Box – or to have built tremendous goodwill and customer loyalty with actual users – i.e. Dropbox? Box has focused on enterprises – who value data – a full six years longer than Dropbox. This means they have a much more full-fledged offering when it comes to features like user permissions, centralized control, etc. On the other hand, Dropbox has a significant lead in registered users: 200 million (at last report) versus 20 million for Box, and many of those users are intensely loyal. Box itself raised a new round of financing late last year – $100 million at a $2 billion valuation. The question, then, is if I had $10 million, would I prefer to invest in Dropbox or Box? 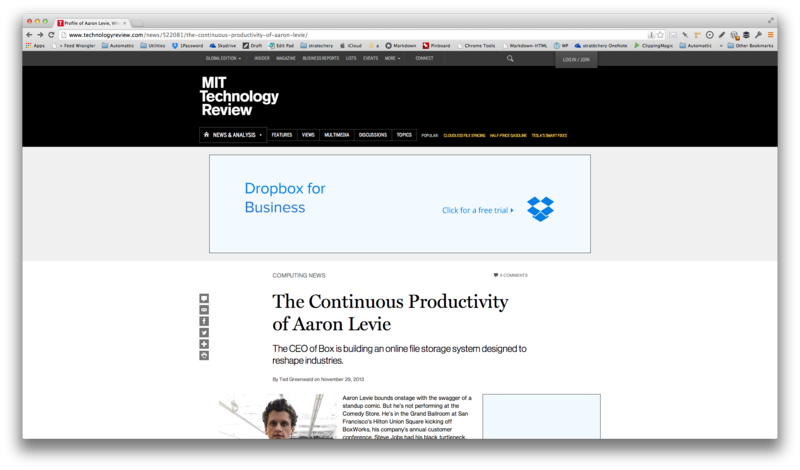 At the most recent valuations, $10 million will get me 0.1% of DropBox, or 0.5% of Box. Thus, if I had the $10 million, I’d invest in Box. Unfortunately, I don’t, which gives me the luxury of sitting back and observing which matters more: consumer headway in a market where enterprise pays, or enterprise capability – and business model – with a smaller base.